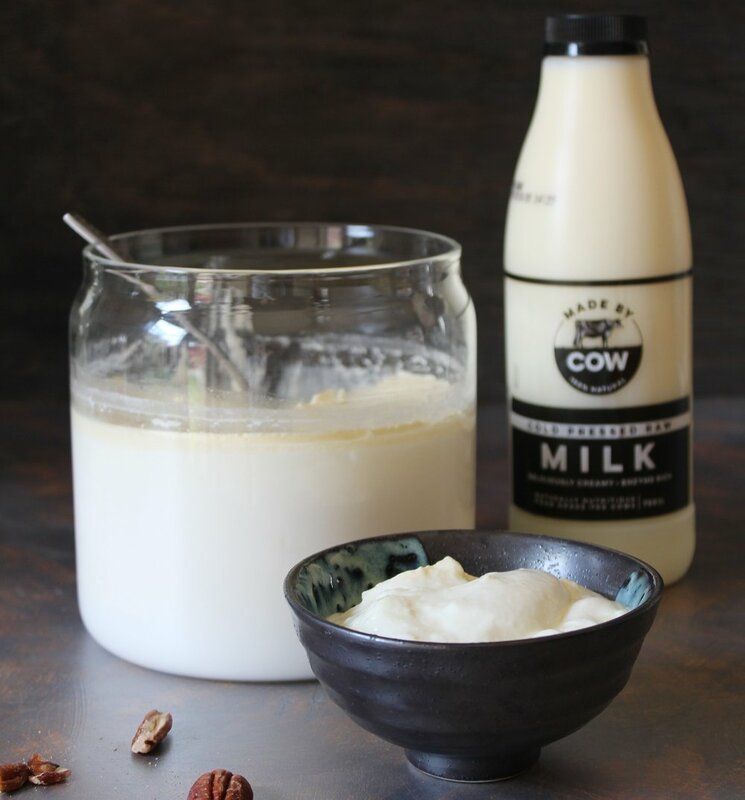 Our friends at Luvele have created a beautifully easy recipe to make your own yoghurt. And as nothing beats homemade, we wanted to share it with you! Before you begin, we recommend you sterilise the yoghurt making container by washing in hot soapy water, then rinsing in boiling water. The main danger with not sterilising is that other bacteria can overpower your starter culture and affect the quality of your yoghurt. Unlike heat pasteurised milk, Made By Cow Cold Pressed Raw Milk does not need to be heated before it is made into yogurt, so once your container is sterilised we are ready to go! 1. Pour the milk straight into the yoghurt making glass jar. 2. Add the starter culture and gently whisk it in. Each starter culture will come with different instructions. Please follow the instructions unique to your starter culture and use the amount specified. 3. Put the lid firmly on the yogurt making jar and place into the yogurt maker. 4. Pour water slowly into the base. The water must not be filled over the ‘tall line’ indicated on the inside wall of the maker. Place the cover lid on top. The milk is now ready to begin fermentation. 5. Use the digital control panel to set the temperature to 38° C (100° F), the time to 24-hours and then press ‘confirm’ to begin incubation. 6. After 24 hours the fermentation is complete. Condensation will have collected under the cover lid during fermentation. Please take care removing it and allow the water to drip into the water bath, instead of your bench. 7. Switch the yogurt maker off and remove the yogurt jar. Straight from the maker the yogurt will be runny and warm. There will be a layer of yellow cream on top of the yogurt. Be gentle with the warm yogurt and don’t stir it or else it won’t set in a perfect white mass. 8. Place the yogurt in the fridge for at least 6 hours to set. 9. After the yogurt has chilled it may be dripped through a muslin cloth or nut-milk bag for 1 hour to remove some of the whey and thicken the consistency. This step is optional.